» A 1001 Midnights Review: JOHN DICKSON CARR – The Three Coffins. It’s been a long time since I first read this book, and I’ve read a lot of them since then, but I think this is still in my Top Ten favorites of all time. 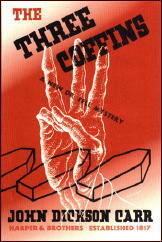 “The Three Coffins” is one of the central works of mystery fiction. I first read it a long time ago too (early teens). It has the ability to open up your imagination in many ways. Glad to see this review reprinted. And all the other 1001 Midnights reviews. I’m not sure, but I don’t think I’ve read this book since I was a teenager either. The plot as Bob Briney outlined it in his review doesn’t ring any bells — I’m being honest here — but once read, no one will forget the chapter totally taken up by Gideon Fell’s Locked Room Lecture. Absolutely wonderful! I can’t think of any Carr novel that I enjoyed more than THE THREE COFFINS. While it does have its detractors, it’s still my favorite. When the Game was a game, and often better for it. It was Howard Haycraft who preserved that chapter on the locked room mystery in his anthology THE ART OF THE MYSTERY STORY. On my list to be re-read. And since I have old lady memory – it will be like reading it again for the first time. 🙂 Thanks for reminding me. There are three other little known locked room lectures in miniature. The first occurs in The Broken O by Carolyn Wells, another in Death from a Top Hat by Clayton Rawson, the third in Whistle Up the Devil by Derek Smith. Smith’s directly references Rawson’s lecture as well as several well known writers and books in the genre. Thanks, John. It’s good to know about these. I may have been told about the Rawson one, but if so I don’t remember ever seeing it. I know I never heard about the one done by Carolyn Wells. She’s an author I have learned to be wary of. Wells’ lecture is only a few paragraphs long but discusses Zangwill’s Big Bow Mystery and an unnamed story by Melville Davisson Post among others. The Rawson lecture was written because he felt Carr left out yet another variation and solution to an impossible crime situation.